Every business owner, manufacturer or individual who sells earrings need to have a special stand to display them in a proper manner. This way, the potential customers can admire the showcased earrings and choose their favorite one. So if you are a person who sells earrings and you’re looking for such a display for your jewelry, then here you found it. Every business owner, manufacturer or individual who sells earrings need to have a special stand to display them in a proper manner. This way, the potential customers can admire the showcased earrings and choose their favorite one. So if you are a person who sells earrings and you’re looking for such a display for your jewelry, then here you found it. 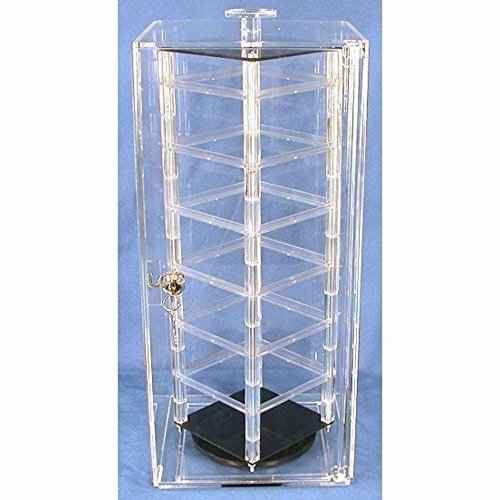 This 48 Card Revolving Earrings & Jewelry Display Case Stand is ideal for your store, for trade shows or exhibitions. It is finished in black with clear bars, to offer an amazing, elegant appeal to the display. It is made of acrylic, so it is ideal for any jewelry store, as it is durable and good looking. This display case stand is rotating, and it can rotate 360 degrees, so your customers can easily see all the earrings displayed and decide which one they prefer and want to buy. This rotating earring case stand can hold up to 48 cards for earrings, with a dimension of the card of 50mm. This display case measures approximately 210 x 206 x 470 mm. It is provided with a lock and key, to offer you maximum security for your valuable jewelry. You can place this earring display case anywhere you want, to attract more customers to your earrings. It has a sturdy design, and a round, rotating base, which allows you to display it on the shelf or countertop. Impress your customers now with this stylish display case, which enables them to get a better access to see the displayed jewelry.